Cooper Report Card: How Did the Governor Fare in 2018? Director's Message 2017 Session 2018 Session GenX Adversaries & Allies Governor's Report Card Amendments What Now? Click here to see legislators’ scores! 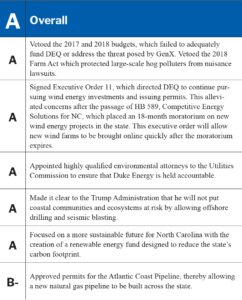 Overall, Governor Cooper earns an A for his actions during the legislative biennium. Throughout his first two years in office, he has consistently advocated for environmental policies that protect communities, strengthen the economy, and improve North Carolinians’ lives. When faced with environmental challenges, Cooper has worked swiftly and surely to identify the problems and implement solutions. Governor Cooper has prioritized moving North Carolina towards a cleaner, more sustainable future, and has worked to allow state environmental agencies to exercise the full scope of their authority. Despite being limited by the General Assembly’s environmental deregulation agenda, he has made progress on several environmental fronts. The Governor does not vote on bills, so his score is based on his executive decisions, including which bills he decides to sign into law or veto, his public statements, and executive orders.